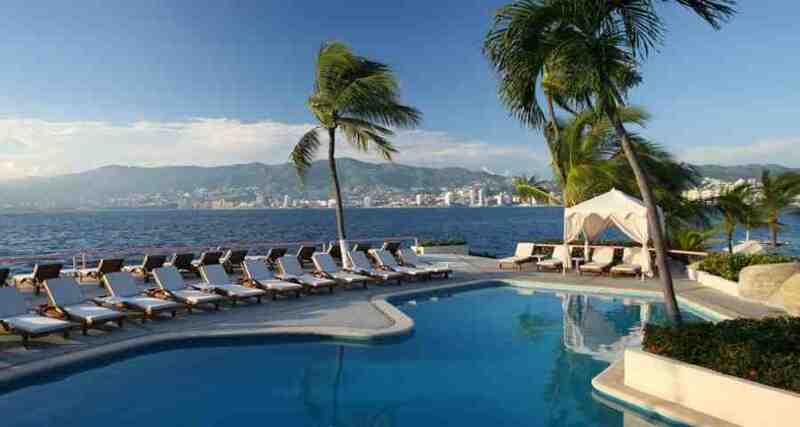 Las Brisas Acapulco is a luxury 5.5* family friendly resort located in Acapulco-Zona Diamante, Mexico. It features 251 rooms, swimming pools and spa services. Set atop a hill and surrounded by 45 acres of tropical gardens and incredible views of Acapulco Bay, Las Brisas Acapulco welcomes you to one of the most idyllic destinations in the world. The deep blue ocean and the vibrant colors of the hotel's plants create a sublime and elegant atmosphere. This hotel has over 40 impressive suites, not to mention more than 200 casitas with a shared or private pool and impressive views for an unforgettable stay. A warm atmosphere and exceptional services at Las Brisas Acapulco have earned it a permanent position as one of the Leading Hotels of the World and as a Virtuoso Select Hotel. Here you'll find the area's only private beach club, as well as fresh and salt water pools. Discover excellent cuisine and quality drinks, in addition to event areas for up to 800 people.